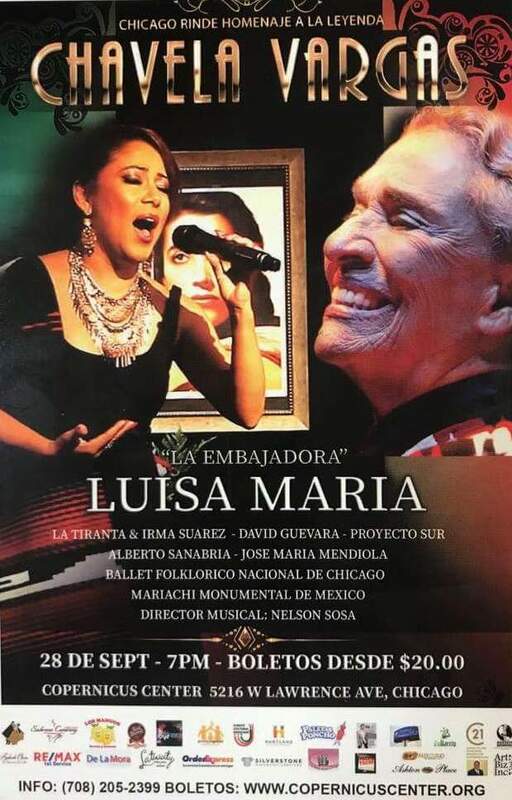 Ambiente Clasico and Growing Together present an artistic musical play on the life of the Mexican singer Chavela Vargas at The Copernicus Center in Chicago, Illinois on Friday September 28, 2018. This entertaining cultural musical drama is supported by the Mexican Consulate General and the National Museum of Mexican Art. Chavela Vargas became an icon of Mexican music and a champion of women’s issues because of the challenges she faced as a Lesbian Woman. The Costa Rican born, later naturalized Mexican singer had a very challenging life as a gay woman trying to pursue a singing career not being accepted in society in that era. Vargas moved to Mexico in hopes to launch her singing career and her love for Mexican Music. Chavela Vargas launches her singing career in the 1940s in Mexico City where she became friends with several artists and celebrities like Diego Rivera, Frida Kahlo, and Jose Alfredo Jimenez. Vargas and Frida Kahlo had a short romantic relationship. In 1961 Vargas released Noches de Bohemia, the first of more than 80 albums. However, Vargas struggled being accepted due to her lifestyle. Consequently, she started drinking excessively and sent her life on a downward spiral. After the death of her dear friend Jose Alfredo Jimenez in 1973, Vargas fell into a deep depression and neglected her health and financial affairs. Her situation deteriorated to the point that she ended in ruins and became homeless. Vargas then moved to Spain seeking to rehab herself and make radical changes in her life. Vargas made a remarkable comeback in the 1990s and achieved international success. While in Spain, Vargas improved her performances and expanded her repertoire. She returned to Mexico in 1991and started performing at “El Hábito” a very well-known club in Coyoacán. Mexico. Chavela Vargas received a Lifetime Achievement Award from the Latin Recording Academy in 2007. Vargas died on August 5, 2012 in Cuernavaca Mexico. Since her death, there have been several documentaries done on her life, and most recently a movie on her life has been released.